Do you love the sun, sand and ocean? 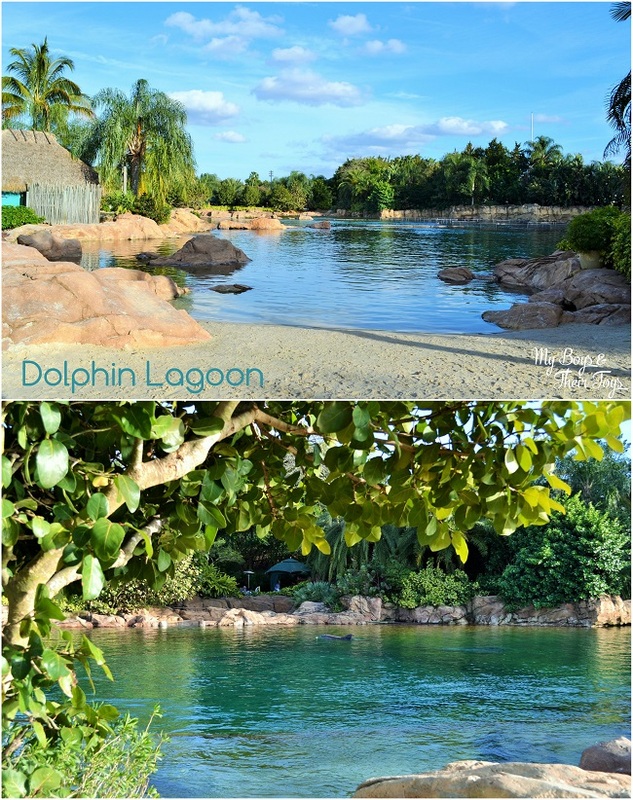 You have to check out Discovery Cove – A Tropical Paradise Day Resort in Orlando, Florida. 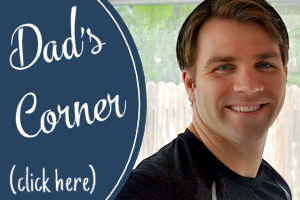 Come read all about our trip! Imagine…in the middle of the hustle and bustle of Orlando, Florida, a tropical paradise that’s serene and surprisingly quiet. 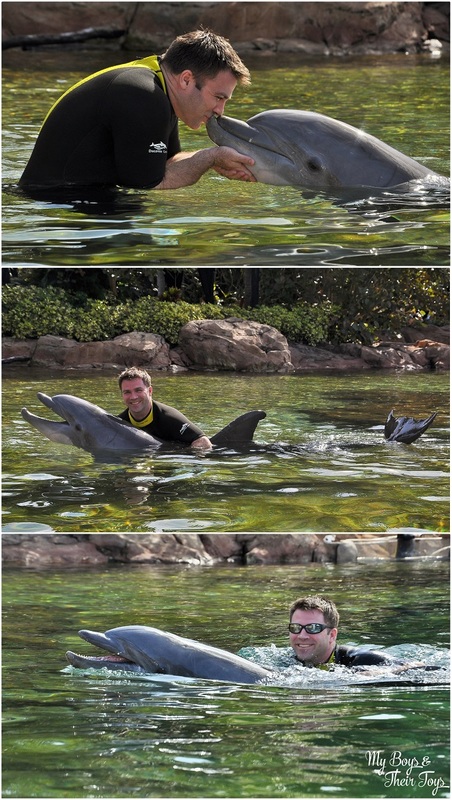 That’s exactly what you can expect when visiting Discovery Cove. This gem of a resort is a must-visit spot where guests can have one-of-a-kind animal encounters and enjoy a relaxing day in the water. 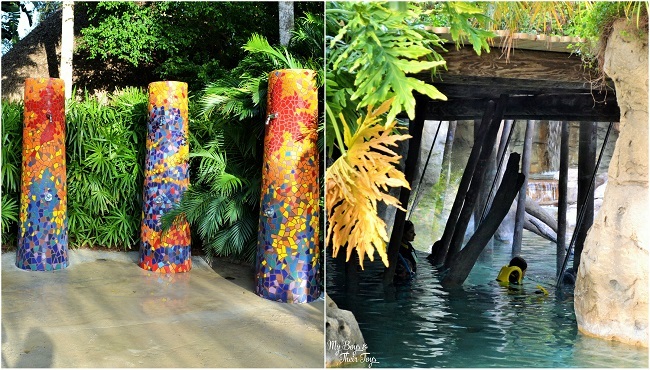 It is highly recommended that you make a Reservation to visit Discovery Cove, especially during their busier months (March – October). 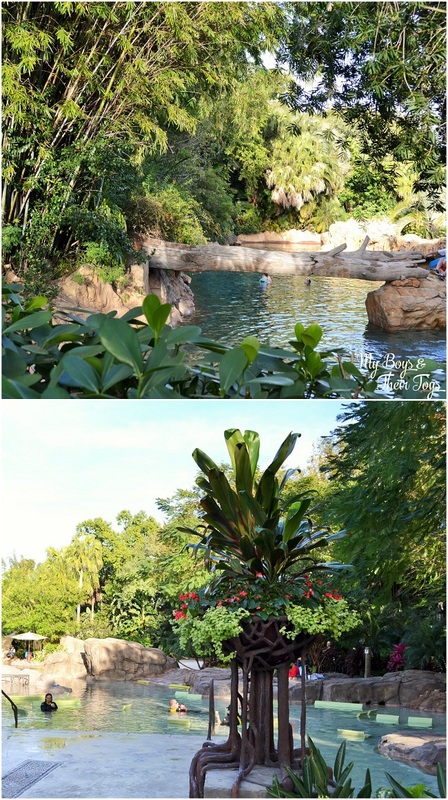 The park restricts visitors to a max of 1,300 guests per day to offer a more relaxed atmosphere for everyone. 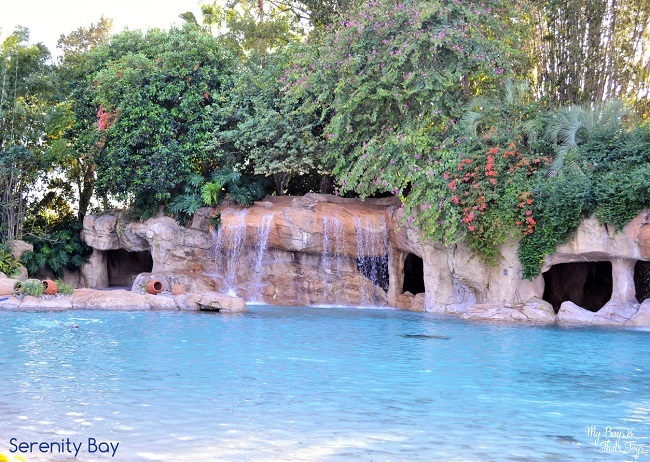 Begin your day at Discovery Cove by arriving between 7:15 and 8am. 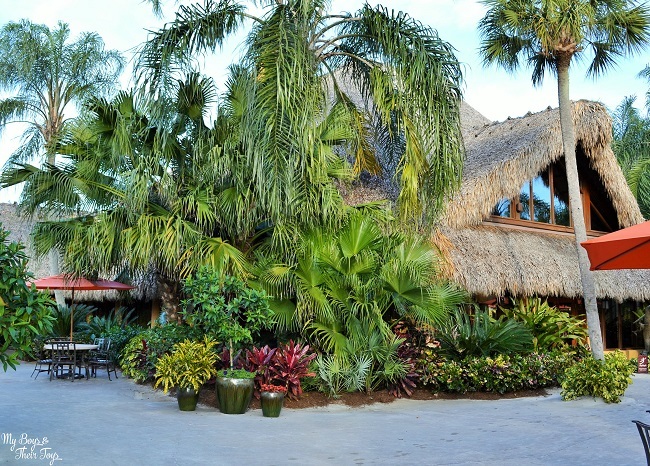 This all-inclusive day resort includes breakfast and lunch buffets at the Laguna Grill for each guest, as well as snack bars with chips, warm pretzels and cookies, alcoholic and non-alcoholic beverages, and more! 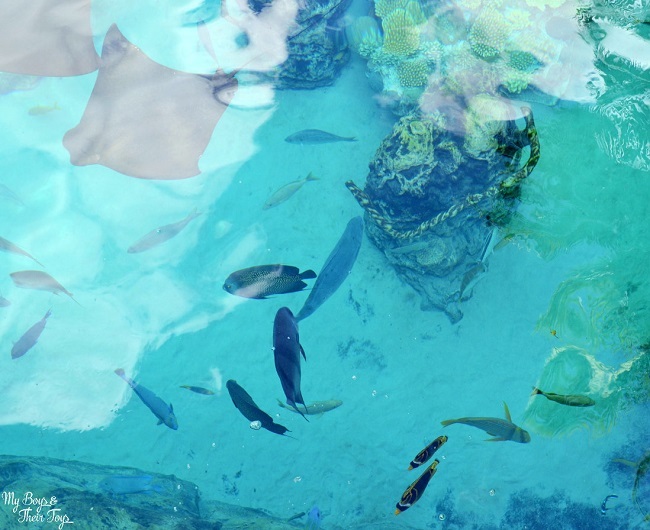 Everything is included with your visit to Discovery Cove – even towels, snorkel gear, wetsuits, and special sunscreen that’s non-toxic to the animals! It is recommended that guests keep their jewelry, other than watches and wedding bands, at home for the safety of the animals. Your day resort ticket includes unlimited visits to The Grand Reef where guests can snorkel with thousands of tropical fish and stingrays. There’s even a swim up section to the shark tank – don’t worry, there’s a protective glass between you and the sharks! 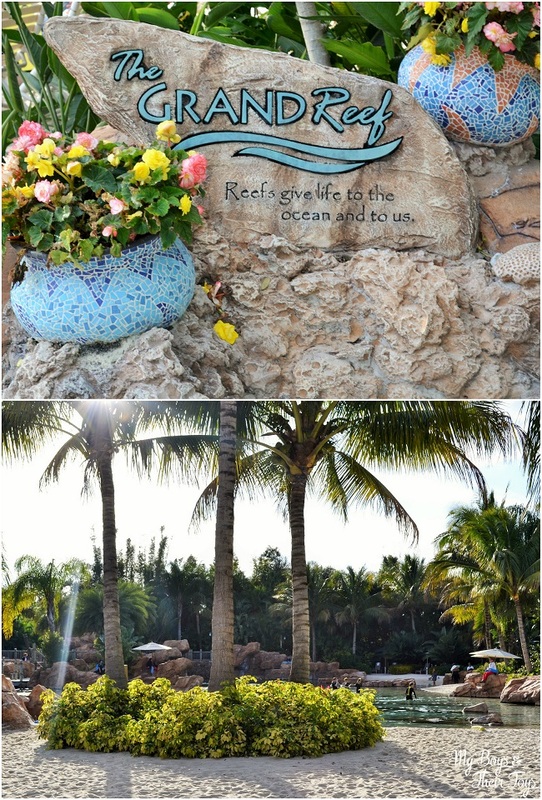 Swim through the reefs and hidden grottos exploring this underwater adventure. The Grand Reef includes a zero entry area for families with younger swimmers and a deeper waters section for comfortable swimmers. When you check-in at Discovery Cove, everyone receives a keepsake picture badge with details about your visit, including a park map on the backside. 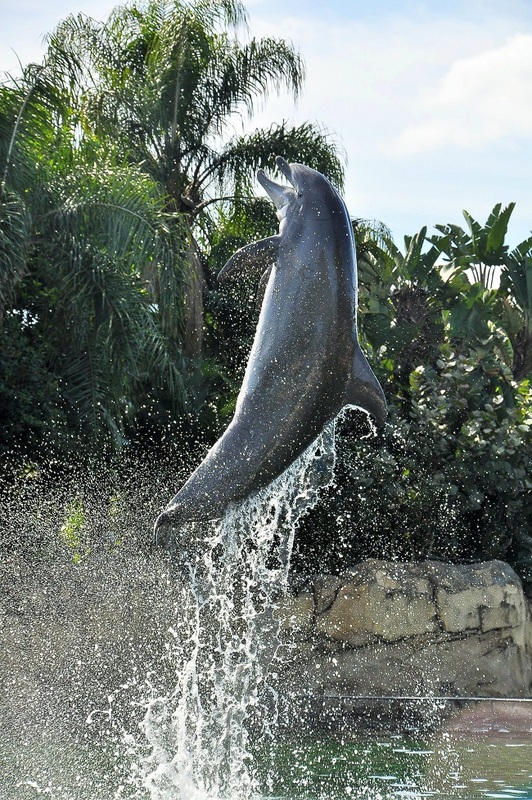 The day resort packages are customized with the option to add a Dolphin Swim Experience, SeaVenture and Trainer For a Day. Children ages 6-12 can partake in the Dolphin Swim Experience with a paying adult. Your badge will include your Dolphin swim time for reference. Our VIP Tour Guide, Todd, suggests booking your swim time in the early afternoon before the weather heats up, that way the 76 degree water temps are not so chilly. We had the opportunity to experience the Dolphin Swim, which includes a 30 minute interactive encounter with 2 bottlenose dolphins. Our first encounter was with a young male dolphin named Hutch. He was fun and playful. 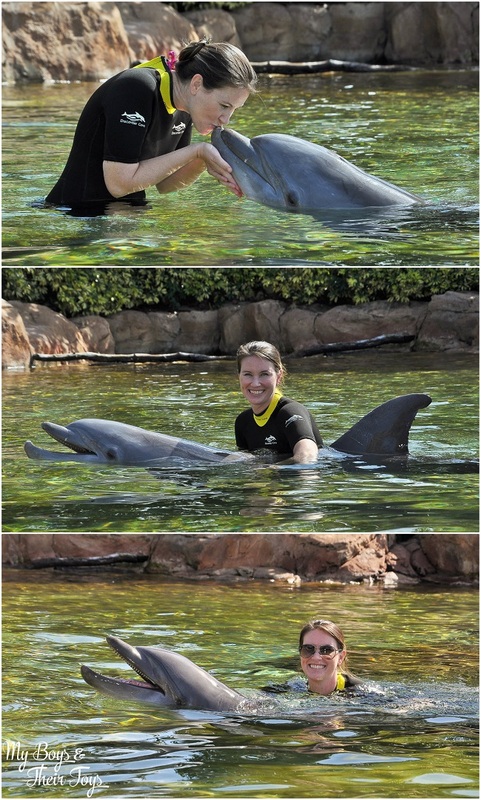 The trainer, Mara, shared information about dolphin behavior and communication, as well as answered guest questions. We also had the opportunity to give Hutch a few rubdowns, hugs, and kisses too! We also met Jenny, a 40 year old female dolphin who loves the camera! No really, she has personality and enjoys being the center of attention. 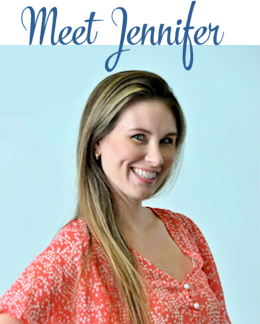 SeaWorld parks actually use Jenny for some of their ads because she enjoys the limelight so much. Our experience ended with a short dorsal fin ride. That was definitely a highlight for Nate and I! This once in a lifetime experience was a bucketlist item for us both, and something we will always treasure. 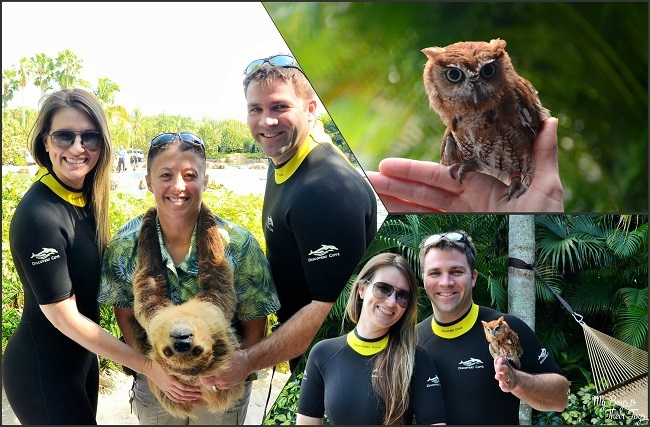 We also had the opportunity to meet Lucy the resident Two Toed Sloth, and interact with Owlee the Screech Owl. This upclose encounter was such a nice treat! But there’s more…a limited number of guests can shadow a trainer, like the reef shark trainers. We had the opportunity to meet and interact with a zebra and leopard shark, as well as feed one! Slip into the 80+ degree temps of Serenity Bay, a freshwater playground and pool area with tucked away caves and waterfalls. Guests can also ride the slow-moving currents in the Wind-Away River. Grab a floating device on your way in and enjoy the lush surroundings of a rain forest, swim past sandy beaches, and more. 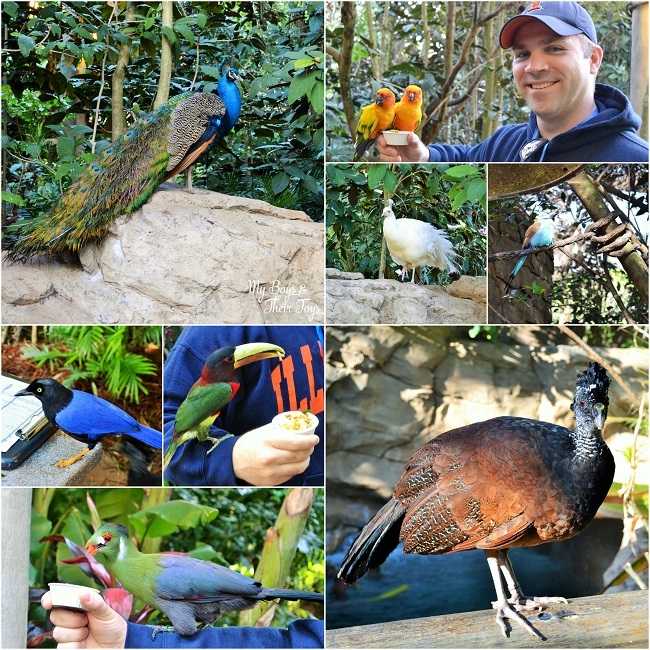 You will even swim through a portion of the Aviary where birds will fly right past you. There’s even a comfortable seating area for guests to relax and take in the sights around them. The Freshwater Oasis is a new section featuring wading adventures and face-to-face encounters with playful otters and curious marmosets. Snorkeling with thousands of tropical fish and rays in The Grand Reef® . Unlimited admission to SeaWorld® and Aquatica, SeaWorld’s Waterpark™ in Orlando for 14 consecutive days around the date of your reservation. 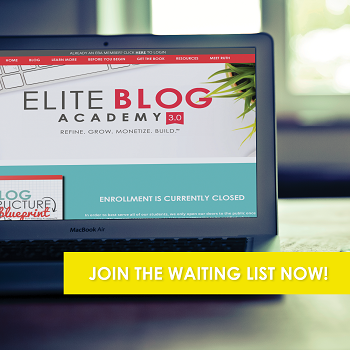 *Upgrade your package for $25 to include a visit to Busch Gardens too! That’s right – you can visit all 4 parks for a fraction of the price! This is an incredible deal for anyone planning a visit to the Orlando area and looking for multiple park experiences. 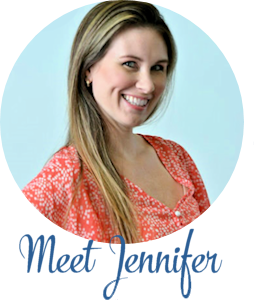 For an additional fee, guests can request a VIP Tour Guide to walk them around the resort and share personal experiences, animal information, and much more. We have to give a special shout out to Todd, our VIP Tour Guide, who was a wealth of knowledge and incredibly friendly and personable. He knew all the best places to take great photographs of the resort and even planned a few special surprises for us. 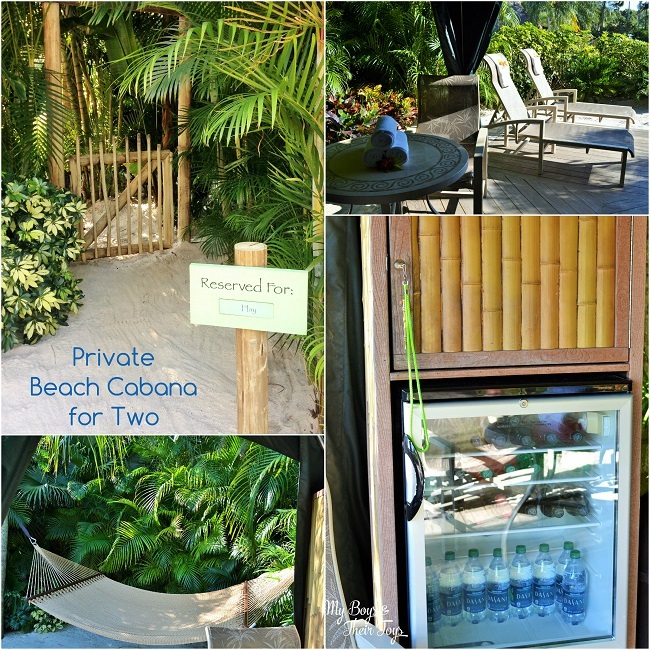 Another added bonus is reserving one of Discovery Cove’s Private Cabanas. There are several on property to choose from and all offer a special view of the park. These tucked away cabanas offer a private space for you and your guests, including table and chairs, stocked fridge with beverages, locker, beach chairs and hammock. Discovery Cove was amazing! 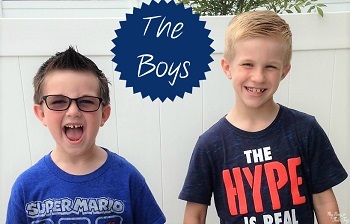 I can’t wait to take the boys next time. If you are looking for an all-inclusive experience packed full of fun and adventure, then let Discovery Cove teleport you to a peaceful tropical paradise that will not disappoint! 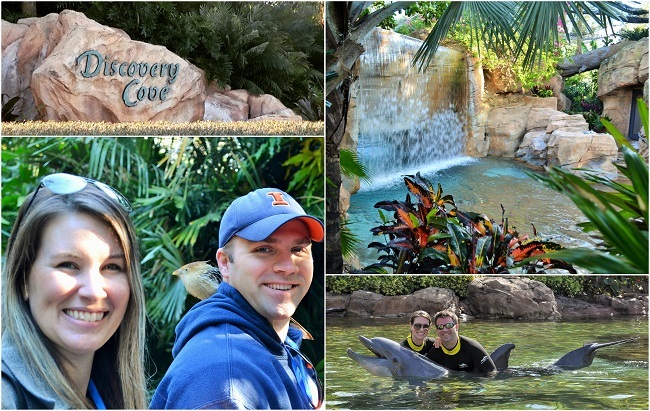 We were invited as media to explore a day at Discovery Cove. All opinions are mine alone, and may differ from yours. Dolphin and some animal encounter pictures courtesy of Discovery Cove. This looks like an amazing experience. What a great way to get away from it all in the middle of Orlando. Definitely pinning this, so I can remember to go on our next visit! So glad you enjoyed the read Kristen! It comes highly recommended by me! 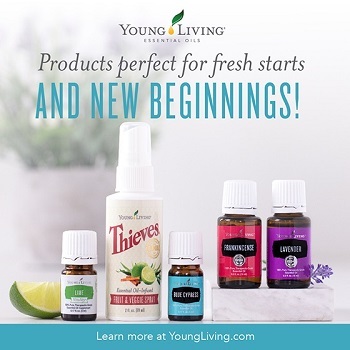 You are very welcome – she will absolutely love it! Wow does that look like a little piece of heaven on earth. Amazing photography definitely captures how beautiful it is. This looks absolutely amazing! Your photos are really breathtaking! Great memories for sure! I’ve heard amazing things about this place. The pictures make it look even more amazing!! What an amazing time! It looks beautiful – and that interaction with the animals looks so fun! This looks like something that my entire family would LOVE! We visit Orlando often, so we will definitely have to check out this location. It would be a nice break from our usual touristy spots. Absolutely! They don’t even allow a lot of guests in for that purpose – so everyone can relax and enjoy the resort without it feeling touristy. I love Florida. And with all this cold weather I wouldn’t mind going now. It looks like this was a great trip. The dolphins are amazing. I wish I were there right now. It looks heavenly. Those dolphins seem so very sweet!